Have no fear, ThemeForest integration is here! You asked, we delivered. A long waited ease of updating the plugins and themes from Envato market is integrated with ManageWP. You probably know Envato as the company behind ThemeForest and CodeCanyon, premium theme and plugin marketplaces. You all know what the flow was before, and how cumbersome it was. Install the theme/plugin on ManageWP. When there was an update, you had to go all the way to ThemeForest or CodeCanyon, download the zipped files of the update and head back over to install that on ManageWP again. Whew, I was tired just from reading that, and you? That’s why we have a shiny new flow on our hands now, so that you don’t get tired from all the traveling around the web, just to install one update. Remember when I said two paragraphs ago how tiring the old flow was? Now the only thing that might be tiring you out is all the extra time you get by not logging into Envato market every time you need to install an update. From now on, you can just connect your Envato account on your ManageWP dashboard, under your profile settings, and that’s it. What we have done is to utilize their API, to allow you to connect the two accounts. Just like Dorothy, click your heels, and the updates will appear in the Updates widget of your websites. Oh, and one more thing: you can connect as many Envato accounts as you want. Some of you might think that this doesn’t save you a lot of time, but think about it like this. Let’s say you have a lot of plugins from CodeCanyon, or themes from ThemeForest. Imagine each update taking 1-3 minutes to download the files. Take into account having to log back into your ManageWP account, and well, the numbers add up. Significantly. Why not use that time to watch an episode of your favorite TV-Show you haven’t seen in a long time. Heck, you can binge watch the whole season. The suggestion bar is always open, and the bartender is always there to listen to you. If you want to throw your suggestion into the pool, please don’t be afraid to do so. We want to hear your ideas, as they will surely make a fine cocktail. P.S. Due to the question about connecting multiple accounts being popular (sorry for not covering that), know that you are able to connect as many Envato accounts as you want. We want to whitelabel this for customers – will that see we have connected to their account? I guess if they go to https://build.envato.com/my-apps/ they will see that is connected but I doubt many people will check there. Is there anywhere else hey can see the connection? Can i add 2nd account of envato ? already have one account added for the most of the themes and plugins purchased from this account. As a suggestion: When using a child theme with an Envato theme, your update tool should check the version of the parent theme instead of the child theme. Tried this out and it’s amazing. If a theme comes with a bundled plugin, how do I update the installed plugins – especially when I’m using a child theme? This is an amazing feature, Great job! Some themes come packed with premium plugins. With a theme update, the plugins updates come packed. Are these plugins updated with managewp also? I have multiple licenses of some premium plugins and some of those plugins come packed with the theme. Are the premium plugins (that come with the theme) also updated when I have a license for another website in my Envato Account? Is it possible to connect to an Envato account with an API key? (Envato API) So that clients that have an account don’t have to share a password and can give me limited access to only the themes / plugins that are needed? 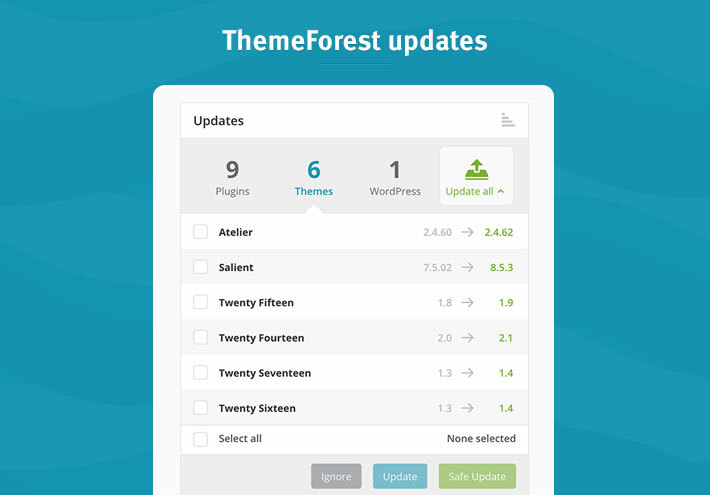 If the themes and plugins are bundled, then usually you have to wait for the theme update in order to update the plugin also. However, that also means, that once the theme update is available that you will be able to use ManageWP to update those plugins. As for the API usage, unfortunately, that is not possible at the moment, but a great suggestion nonetheless! Awesome feature guys! Congrats again. Really great to have connnection to Envato! Works like a dream, thanks guys. hmmm…. it sure is an amazing feature. However there are issues….? If i hit update, it removes wooocommerce and installs that plugin…. So something to look into? Hey there, this is definitely something we would like to look into for you. Can you file a ticket so that our support team can take a look? Awesome 🙂 +1 for multiple Envato accounts, either connected per client or per site. Awesome, this will smooth things out a lot. Will we be able to add multiple Envato accounts? ie. So each customer site can have their own envato account connected? Amazing Guys, this was such a tedious process and this will improve our update my process massively. I ended up missing so many of these updates due to the manual process. This is pretty neat! 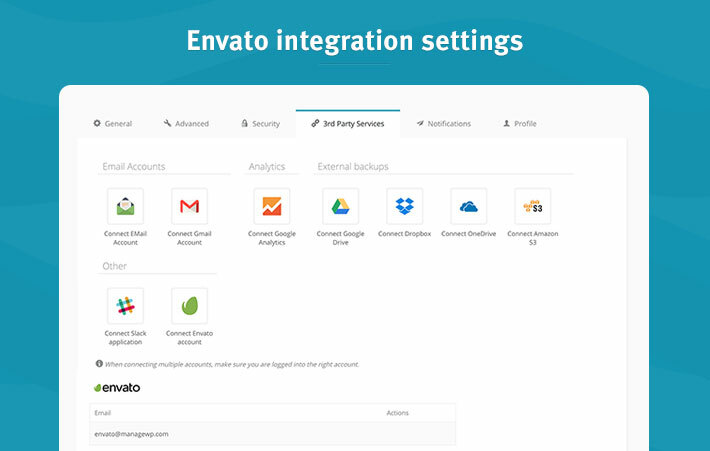 Can I connect more than one Envato account? That’s what I would need. Wow, this is great! Got one connected… How can I connect multiple Envato accounts? I’m stumped. For anyone else who is having trouble with this: Signing in with different accounts at ThemeForest or CodeCanyon didn’t seem to change what account was connecting with ManageWP – Instead, make sure you are signed in with the Envato account you’d like to connect here https://build.envato.com/my-apps/ before connecting ManageWP; that’s the one that matters.